The title of this coffee table book should probably be reworked to reflect its actual emphasis on the beginnings and “Classic” eras of American golf. 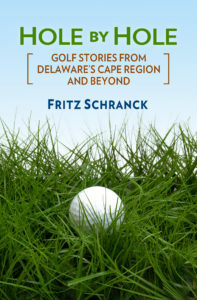 It uses rare old photographs, patent drawings, and advertisements to depict the world of golf up to about 1930. The text shoots forward in one spot or two all the way to 1950, with a quote from Ben Hogan. In keeping with the chosen subject matter, all the pictures, and I mean all of them, are printed in sepia tone. I assume this was an attempt to create a antique brown, “old-time” look. It’s a nice touch, but an occasional black-and-white print wouldn’t have hurt for variety’s sake.